The challenge of designing a device to learn what marine mammals do on dives is the stuff of dreams for an electronics engineer. 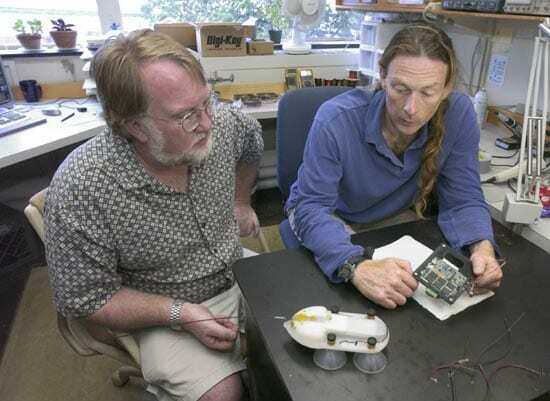 In the spring of 1999, the time was right to build the digital acoustic recording tag, or D-tag—an instrument to record the movements of whales and the sounds they make and hear in the ocean. Miniature cell phones, MP3 players, and PDAs had created a demand for small, lightweight, dense memory components and batteries. In many ways, the tag is just like an MP3 player, PDA, and home medical monitor all rolled into one, and then sealed against seawater and the pressure in the deep ocean. The D-tag is actually a miniature computer with its own microprocessor, memory, and software. It records sound using one or two hydrophones (underwater microphones) with better-than-CD quality—not only the sounds made by the tagged whale but also sounds from other whales, noises from boats, and all of the sonars and sound sources in the area. The tag also contains a digital compass, a pressure sensor (the underwater equivalent of an altimeter) to measure the depths of the whales’ dives, and an orientation sensor that measures the animal’s pitch and roll. The pitch sensor records a whale’s body undulations fast enough for us to count each beat of its tail fluke. Think of the displays in the cockpit of a small plane: The tag sensors are measuring similar things but under water. Everything gets stored in digital form. The tag has as much as 6 gigabytes of memory, enough to record continuously for a full day. To keep out the saltwater and survive harsh treatment from socializing animals, the tag has a plastic skeleton and is sealed inside a thick urethane bag. To keep the weight and size down, the tag does not have a pressure housing (the aluminium bottle normally used to protect electronics from high pressure in the deep ocean). Instead, we spent a lot of time at the WHOI pressure-testing facility choosing electronic components that would withstand pressures of up to 3,000 pounds per square inch—that’s 200 times atmospheric pressure at sea level. As a result, the entire electronics unit measures about 4 by 1.5 by 1 inches and weighs about 5 ounces—no problem for even a small whale to carry. To allow us to retrieve the tag after it comes off the whale, it is equipped with flotation so that it rides atop the surface like a buoy, and a tiny radio beacon, so we can find it by tracking its radio signal. Of course, the tag is no use at all if it doesn’t stick to the whale, and so we have spent a lot of time studying suction cups. For three years, we tested every suction cup we could find to figure out which would hold best. Finally, we decided that we had to build the cups ourselves to get the right mix of strength and softness—o be tenacious and yet not hurt the whale. Using a mold built by the WHOI shop, we now make cups out of medical-grade silicone that work incredibly well. That first caffeine-powered field season in 1999—working with northern right whales in the Bay of Fundy with the International Fund for Animal Welfare—was just the start. Since then, the tag has gone on more than 30 field expeditions all over the world. We have worked with D-tags on sperm whales in the Gulf of Mexico and Italy, on manatees in Belize, on narwhals in northern Canada, on beaked and pilot whales off the Canary Islands, and on humpbacks off Australia and Cape Cod. Colleagues have taken the tags to Antarctic islands to study fur seals and to California and Canada to work on blue whales and gray whales. D-tags have gone on the deepest dives ever recorded on a marine mammal and have discovered the sounds made by two of the world’s most mysterious whales: Cuvier’s and Blainville’s whales are little-known mid-sized beaked whales whose only claim to public attention is their occasional mass strandings associated with sonar use during naval maneuvers. Many marine mammalogists have never seen these whales alive! They are very shy and usually live way out in the big blue. They are so inconspicuous at the surface that you can sail right by them unless the sea is flat and you know what to look for. We have learned that these whales are incredible divers. Using D-tags, we have recorded dives 85 minutes long with depths of up to 1,900 meters. 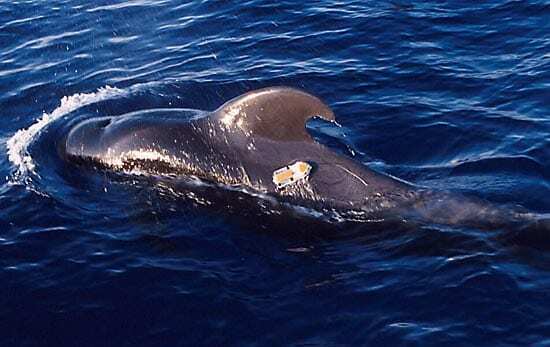 Amazingly, the tag is sensitive enough to hear echoes from objects in the water, insonified (lit up—but with sound) by the click sounds made by the beaked whales. My hope is that this device will eventually help us learn how to be better neighbors under water.